This image from the City of Boston Archives, taken around 1975-1976, shows two Revolutionary War reenactors playing music outside of 20 Hudson Street in Chinatown. The Fallout Shelter sign seen on the building is the same one that was removed and put back up during renovations to what is now Station KTV. At the time the photo was taken, the building housed the Chinese Local Development Corporation and has had a number of other uses since. The sign remains in its new location today, and the Fallout Shelter is now a much older 57. Photo above from the City of Boston Archives and used under Creative Commons licensing. No portion of the photo was changed or altered in any way. This interior Fallout Shelter sign, with the rare “FLOORS” overlay, still hangs in the stairwell of a Downtown Boston office building. Although larger number were made to be used with the “FLOORS” overlay, the person who hung this sign decided to use the smaller numbers that were usually used to indicate the capacity since they’re smaller. The “FLOORS” overlay was not often used and is now very rarely seen on existing signs. Sometimes though, even rare species are still seen out in the wild. The United States Post Office Branch in Middleborough, Massachusetts still sports both an exterior and at least one interior sign. This post office is by no means unique in having been designated as a Fallout Shelter; multiple other branches throughout Massachusetts and the United States were also designated based on their size and construction alone. Many still only have exterior signs if they have them at all, so seeing an interior sign still intact is somewhat unique. Back In December of 2017, New York City announced it would be removing Fallout Shelter signs, mainly from it’s schools. This has definitely been the case at some schools, as many in Manhattan that once had signs on them no longer do. This article from the Staten Island Advance even shows a comparison picture from when a sign was posted on Public School 18 and the after picture showing just the shadow of the former sign. However, a visit to New York City in August showed that many private buildings still have signs on them. Heading to Astoria, Queens, one can still see the damaged and bent remnants of an “S” Public Shelter sign, which was the precursor to the above Fallout Shelter signs from 1961. This was not included in the removal program as it was likely forgotten about long ago. It is likely the only one like it left in the city and most anywhere else in the country. However, further down the island in East Village, someone inexplicably put up a new Type II interior sign on the front of an apartment building. Note the new condition of the sign as well as the new screws used to put it up. It is possible that this was done as a joke, or perhaps the old one was taken down for renovations or other reasons and the owner thought it needed to be replaced. Either way it was a rare and welcome sight. There were dozens of other signs seen during this journey, again mostly on private buildings. However, many public housing buildings still had theirs. As time goes on, many will be taken down, but for the time being, these and many others are safe. 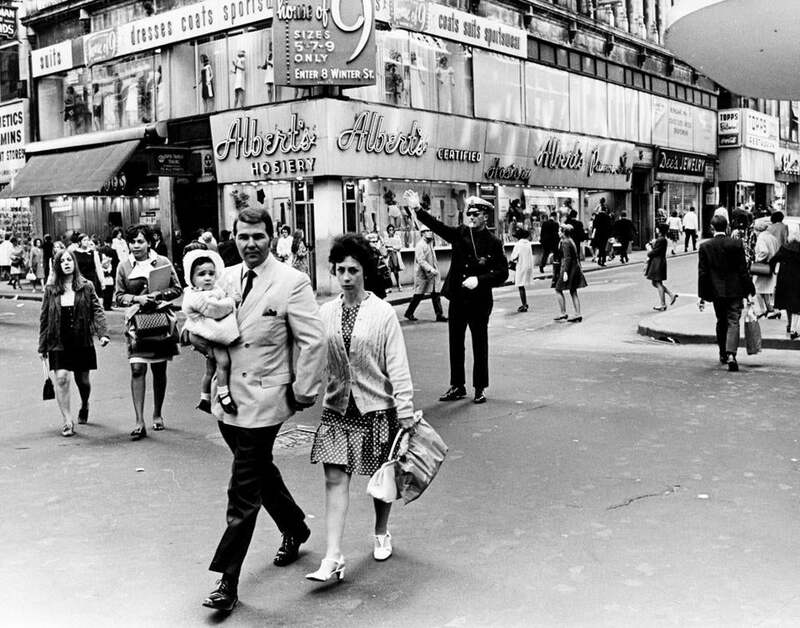 This 1969 photo at Summer and Washington Streets in Boston, which is now known as Downtown Crossing, shows a lively scene with people shopping and a couple out with their baby. The pedestrian plaza had not been created yet, so a cop directs traffic behind them. To the left of Albert’s Hosiery, a Fallout Shelter sign is seen above the entrance to what was then Washington Station (now known as Downtown Crossing MBTA Station). The station entrance remains, but the Fallout Shelter sign is gone, and as the photo below shows, was actually gone by 1973 (possibly when they placed new color-coded MBTA signage and the ubiquitous T symbol over the entrance). Almost all of the downtown subway stations were designated as fallout shelters, with the last of the signs in the system coming down in 2014 when the Government Center Station headhouse was demolished (the only two stations whose shelter status is unknown is Bowdoin, which has a fairly modern concrete headhouse with no evidence of signage, and Adams Square, which was near what is now City Hall Plaza and demolished in 1963 to make way for the plaza and the new city hall building). Civil defense supplies remain dumped, however, at the end of an unused tunnel at Boylston Street Station, likely to remain there forever. A vast majority of the downtown department stores in this area were also shelters. The only sign left of all the stores (and the only store left, of all the original stores, as well) is inside an entrance of Macy’s (formerly Jordan Marsh) and shows shelter space was available in the basement and on floors 2-5. Above photos owned by the Boston Globe. 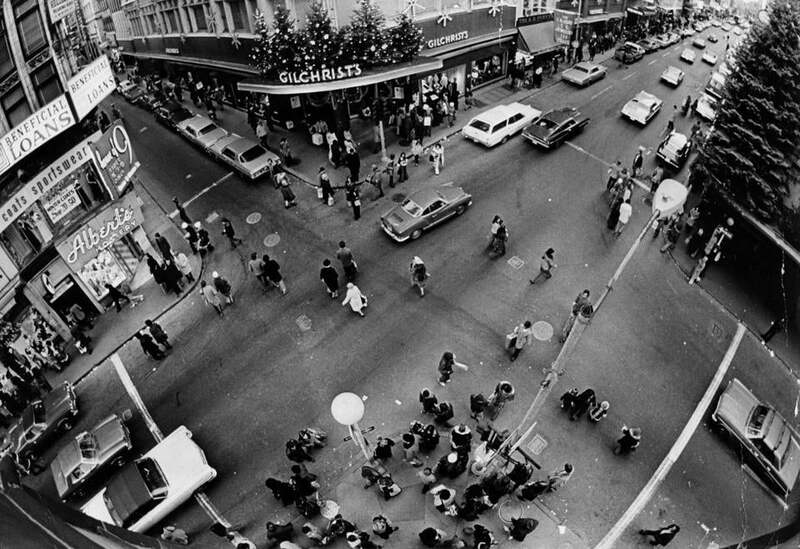 Top photo taken on May 13, 1969 by William Ryerson, Globe staff. Bottom photo taken on December 24, 1973 by Ellis Herwig, Globe staff. Although Fallout Shelters had largely been forgotten about by many, save the occasional story of finding a shelter or supplies, they got a resurgence of fame from mid 2017, when things heated up between the United States an North Korea, through January 2018 when Hawaii accidentally broadcast an Emergency Alert to their residents that a ballistic missile was inbound to the island. Traffic to this site increased dramatically and stories about Fallout Shelters were popping up throughout many different media outlets. New York City, worried that all the trouble between the US and North Korea would lead to their residents using one of the many former public Fallout Shelters still marked in their city in case of attack, began a campaign to start removing the signs from their buildings. However, here we are now in May of 2018 and things have changed quite a bit. The United States and North Korea have not only simmered their nuclear debate, but the war between North and South Korea has ended and North Korea has agreed to stop their nuclear program. Hawaii has taken steps to ensure that another errant alert is not broadcast, and while news stories and tensions were beginning to trend back toward 1960s levels (the Doomsday Clock was even moved to two minutes to Midnight in January), the tides have changed considerably and it seems we are again moving away from the possibility of a nuclear showdown. What does that mean for the Fallout Shelter? Likely, it’s recent fame will be the most we will see for a while to come. Many signs remain, though. While New York City did begin their campaign to remove their old Fallout Shelter signs, it seems the focus was mostly on schools and a few recent visits to the city show there are dozens still up on public housing buildings and many private buildings. Signs remain (for now) throughout Boston and many other major cities. To document some of the stories that were featured during the recent surge of interest, I have created a new page called the News Archive which lists news stories from around the nation about Fallout Shelters and civil defense. One of particular interest from Long Island, NY in September of 2017 shows a school that found walled-up supplies in a basement crawl space. I will continue adding to it if new stories appear or others are found. Fallout Five Zero is here to stay though, and still looking for shelter submissions and information. Please visit the contact page to submit or reach me. I am hoping to get more content up as the summer approaches, including some new “Out of Town” segments. Stay tuned and happy spring! Contributor John McDonald shows us photos taken by Nathan McDonald of the now fading Fallout Shelter sign at the former New England Distributing & Warehouse Corporation building on Constitution Road near the Charlestown Navy Yard in Charlestown. Time and weather have not been kind to this sign, which has a listed capacity that cannot be seen. The building itself is closed and essentially abandoned, and as a trivia note, would have been the closest Fallout Shelter to the USS Constitution (also knows as Old Ironsides). which is the oldest commissioned naval vessel that is still afloat and a popular tourist attraction to this day. Photos taken by and property of Nathan McDonald and used with permission by Fallout Five Zero.